→Join Us For Our Next First Friday! All content of this Internet site is protected by worldwide copyrights, trademarks, service marks and trade names and as such is owned/controlled by WordSalad LA and She Speaks Productions or by the party credited as the content provider. The User of this Internet site may download content only for personal, non-commercial purposes. No further reproduction or modification of the content is permitted. This body of content is provided "as is", without warranty of any kind, either express or implied, including, without limitation, warranties of title, the implied warranties of merchantability or fitness for a particular purpose. The User of this Internet site hereby acknowledges that use of this Internet site is at the User's sole risk. The information presented here has been compiled from internal and external sources. No representation is made, nor is warranty given as to the completeness or accuracy of such information. The User should be particularly aware that this information may be incomplete, may contain errors or may have become out of date. Therefore, the User should verify information obtained from this site before acting upon it. This Internet site may provide links or reference to other sites. Since we have no responsibility for the content of such other sites, this Internet site shall not be liable for any damages or injury arising from the content of such other sites. Any links to other sites are provided merely as a convenience to the Users of this Internet site and any concerns regarding any external link should be directed at that site's administrator. The copyrights, trademarks, service marks and trade names shown in this Internet site are protected in the United States and internationally. 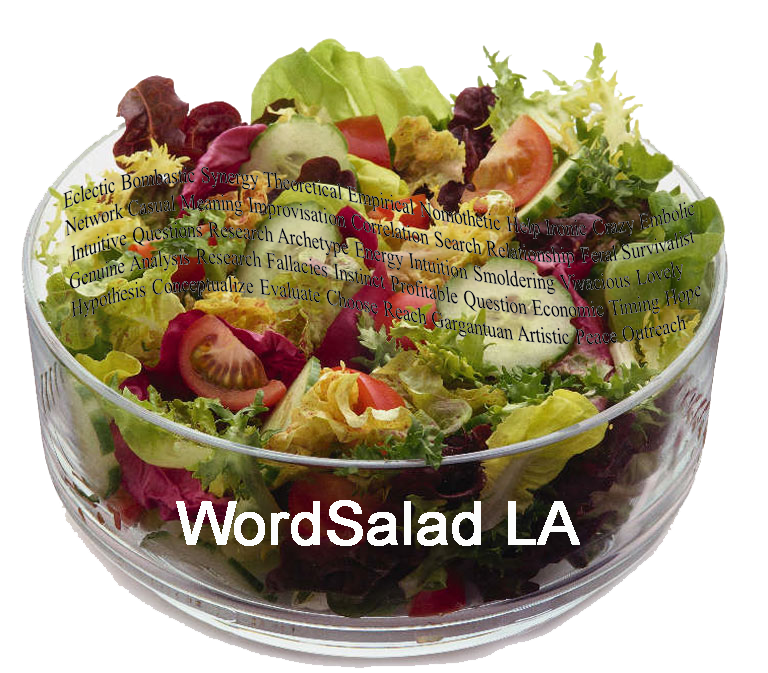 No use of these may be made without prior, written authorization from WordSalad LA, and/or She Speaks Productions, or a site partner concerned, except to identify the products or services of the company. We shall not be liable for any damages or injury resulting from the User's access to, or inability to access this Internet site, or from reliance on any information provided in this site. We may make changes to the information in this Internet site, or to the services and/or products described therein, at any time without notice. We make no commitment to update this information.